Obverse description: Devolved head comprising of diagonal line from edge to centre, terminating in a crescent. The line bisects a wreath of two rows of oval pellets. One open crescent, or ear, in front of the terminal of the diagonal and a two in a line above. Traces of a raised face in front of the crescents. Traces of lines forming a robe below the ear. 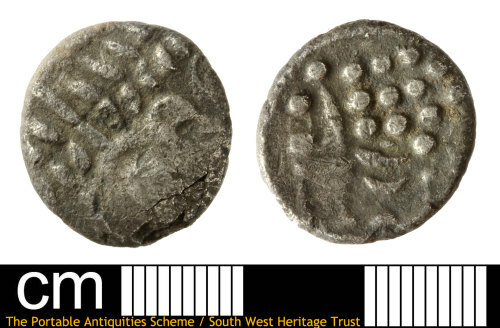 British Iron Age silver stater, uninscribed South western (Durotriges), 50-20 BC, VA 1235-1; BMC 2525ff, ABC 2157.